Robert I of France was the elected King of West Francia from 922 to 923. Before his election to the throne he was Count of Poitiers, Count of Paris and Marquis of Neustria and Orléans. He succeeded the overthrown Carolingian king Charles the Simple, who in 898 had succeeded Robert's brother, king Odo. East Francia or the Kingdom of the East Franks was a precursor of the Holy Roman Empire. 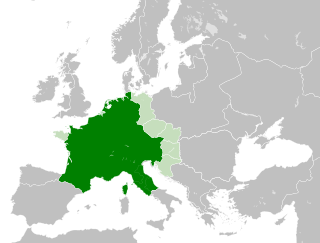 A successor state of Charlemagne's empire, it was ruled by the Carolingian dynasty until 911. 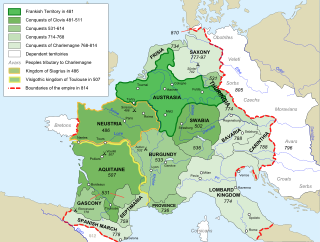 It was created through the Treaty of Verdun (843) which divided the former empire into three kingdoms. The Battle of Lucofao was the decisive engagement of the civil war that afflicted the Frankish kingdoms during and after the reign of Dagobert II (676–79). In the battle, the Neustrian forces of Theuderic III and his majordomo Ebroin defeated the forces of Austrasia under the dukes Pippin and Martin.